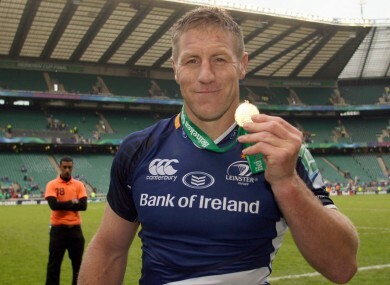 Brad Thorn shows off his Heineken Cup medal. FORMER ALL BLACK World Cup winner, and winner of just about everything else, Brad Thorn is in line for a remarkable return to the professional rugby field in Australia’s National Rugby Championship (NRC). The 41-year-old lock won a Heineken Cup with Leinster in 2012, less than a year after winning the Rugby World Cup with the All Blacks in his native New Zealand. Thorn retired from rugby last season after a spell with the Leicester Tigers in the English Premiership. Last May Thorn was named as the forwards coach for the Queensland Reds’ elite development squad on a three-year deal and he has already said that he would consider playing for the Reds in Super Rugby this season if needed. As part of the move to Queensland Rugby he is also a player/assistant coach with Bond University Queensland Country in this year’s NRC, the professional competition in Australia below Super Rugby. And Thorn has been named among the Country substitutes ahead of their Round 5 match against the Western Sydney Rams this weekend as regular back-row forward Conor Mitchell has been called up to the Australian sevens squad. “I’m not making a comeback … I always said I was just playing less,” Thorn quipped earlier this year. Thorn is remembered fondly at Leinster, having made quite an impact in his short spell at the province. The 6ft 5in bruiser, who moved to Australia from Otago as an eight-year-old, initially made his name in rugby league, winning two NRL titles with the Brisbane Broncos, representing Queensland 14 times in State of Origin and earning eight Test caps for Australia. Thorn returned to New Zealand and rugby union in 2007, after previously doing so from 2001 to 2004, and went on to win the 2011 Rugby World Cup before club spells in Japan, Ireland, New Zealand (with the Highlanders) and England. Email “Former Leinster and All Black star Brad Thorn set for return to elite rugby”. Feedback on “Former Leinster and All Black star Brad Thorn set for return to elite rugby”.